Every Wednesday at work we have a "treat day", one person brings treats for the company. We have enough people that you bring treats for everyone once a year. My treat day tends to fall in February/March since it's tax season and I'm less busy than the accountants this time of year. So today is my treat day and I just know you want to know what delectable goodies made the cut! Are you familiar with Nicole over at Baking Bites? I knew she'd have lots of goodies to choose from. She recently came up with a recipe for Samoas Bars, which I bookmarked for treat day. While I was looking over the recipe I thought I'd poke around for other bar recipes as well. Bars are easier to make for large groups... I'm not anti-cookie or anything. So I had decided on Samoas Bars, but opted out due to the time consuming dipping aspect. 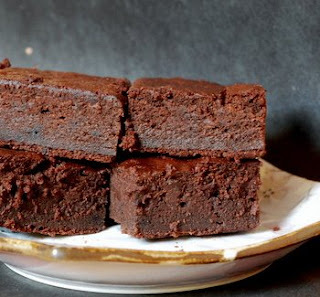 Instead I choose Root Beer Brownies, delicious little bites of fudgy brownie goodness... 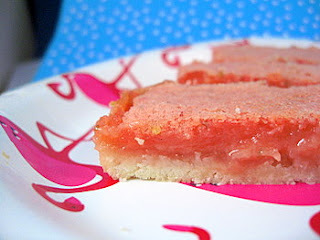 Strawberry Lemonade Bars, tart, but not overly so... Nicole did not disappoint! I also made Peanut Butter Fudge, Texas Sheet Cake, and Salted Chocolate. I can't find the recipe I use for Peanut Butter fudge online, so I'll type it up this week. 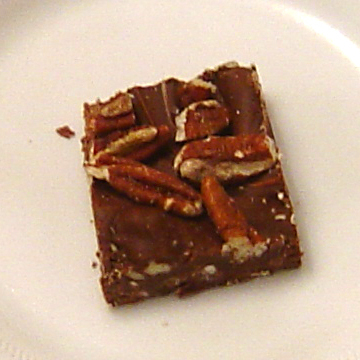 If there is anything left at the end of the day I'll get pictures of the Texas Sheet Cake and the Peanut Butter Fudge. YUM! I wanna work where you do! Root Beer Brownies and Strawberry Lemonade Bars sound so decadent in a refreshing way. I totally agree with you about bar cookies being easier for larger groups. I think they travel better too. Janet: It is nice, one of the few times that most of the company is together for break. Tamy: You'd love the strawberry lemonade bars... no fake ingredients ;) and the brownies were from scratch too... no preservatives well maybe in the chocolate... but it's not from a mix at any rate.